Hello folks! It's that day of the week again! Surprisingly I've been able to get this HDR Friday going without missing a beat since February, so I'll try to keep this going as long as I can. 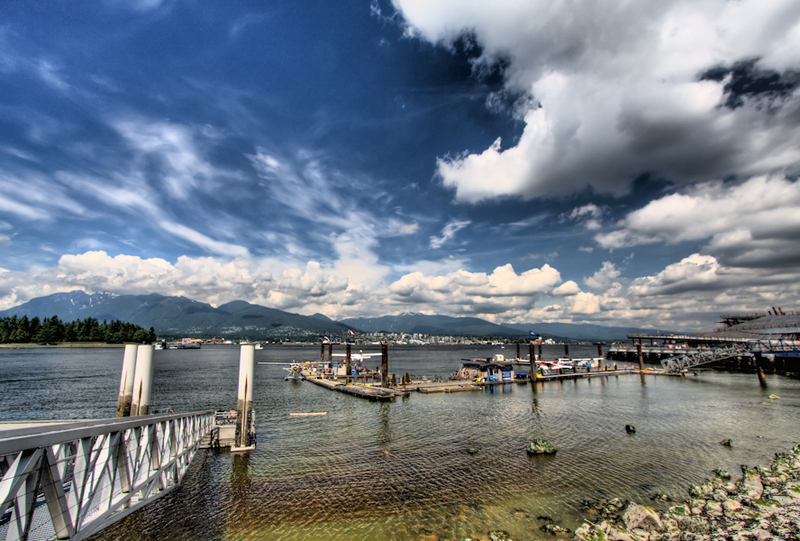 Today's photo represent one of my favorite place to relax in the Pacific Northwest, Vancouver's Portside Park (or Crab Park) located just within the Burrard Inlet. While sitting on any one of the benches in this park, you would get the waterfront view of seaplanes landing in front of a gorgeous backdrop of North Vancouver and Grouse Mountain in a distance. On the opposite view, behind the benches there's this large grassy field just right below the beautiful architecture of Vancouver skyline, without a doubt this would be a place I would go weekly just to wind down and clear the mind. It's too bad that it's 1300 miles away from Los Angeles and I have yet to find a spot that's similar to this place in Southern California. Anyhow, for bonus photo below is one of my first HDRs of the view taken back in 1998.